You can produce plastic plant pots on our thermoformers in any size, with or without holes. 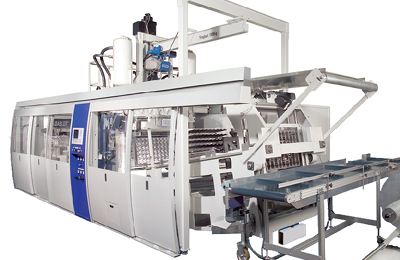 The precision of our machines guarantees continual quality for your products. Our thermoformers achieve an extremely even spread of the plastic over the whole plant pot. Thanks to the high precision of our technology, you can produce your plant pots in exactly the form you wish. Our thermoformers achieve an extremely even spread of the plastic over the whole form of the plant pot. 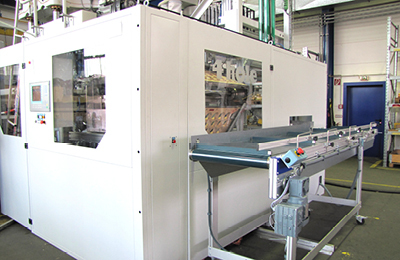 Our machines achieve high output volumes depending on the model and product with a high degree of automation. For the production of plant pots we recommend the machines in our M-LINE in combination with hole puncher/stacking unit 4hole. This means you have all options at your disposal for forming with simultaneous or separate cutting. The convincing characteristics of the M-LINE feature high productivity, innovative drive technology, high stability and simple operation. On an ongoing basis, we have continuously developed the removal system for tools and insertion in the transport pallets. Our hole puncher/stacking unit 4hole transports the formed plant pots directly to pallets after the forming station and ensures precise hole punching in the puncher. The offcuts occurring are removed by the lower tool by suction. The punched plant pots are transported by pallets to the stacking unit where they are stacked and counted before being finally shunted away by a conveyor.